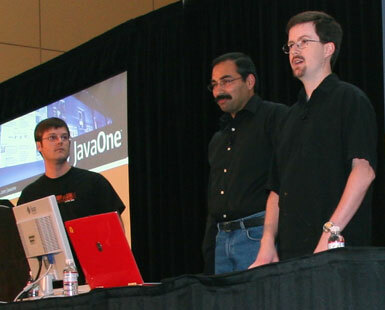 The JavaOne conference, held May 6-9 in San Francisco and organized by Sun Microsystems, brought together developers from industry, education, and other markets, filling the Moscone Convention Center with a wide array of sessions and exhibits for the open source Java developer community. Campus Technology sampled some of the sessions of special interest to higher education -- highlights follow. 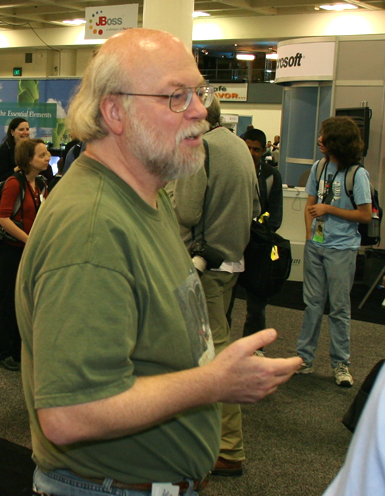 University students joined Java co-inventor James Gosling (above) for a tour of Java-based technologies in action and on display in the pavilion. 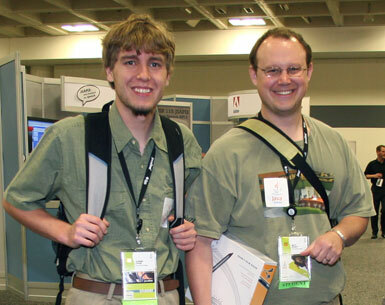 Among those examined were SunSPOTs, programmable sensor networks; Project Sydney, a real-time control system; and Tommy Jr., a completely autonomous ground vehicle. "There are sensors that can detect when a ball is present in a particular part of the system. They have a color sensor that can identify what color ball is passing by, and that information is used to actuate the motors in different parts of the system... so when a ball arrives at an end-slot, a motor will flip the flipper to shoot the ball to the next stage of the process. When the color sensor detects a ball of a particular color, that information is fed back to the control software so that it can adjust the guide positions to then drop the ball into the correct collection chamber where we are sorting the balls by color. 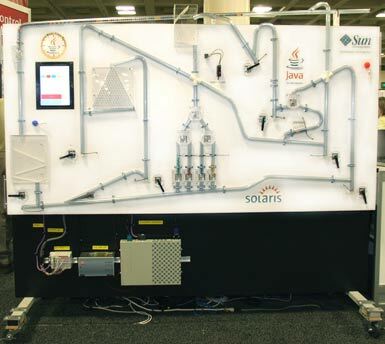 All of this is being controlled by a real-time Java software program, which is running on Sun's Java Real-Time system, running on Solaris -- which itself is running on an industrial-strength PC unit that we call Blue Wonder." 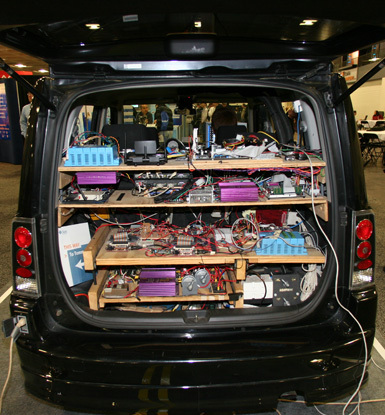 Tommy Jr. (above), a modified Toyota Scion, was designed for the DARPA Urban Challenge of 2007, explained Paul Perrone, founder of Virginia-based Perrone Robotics. The vehicle is completely autonomous -- no one was either on board or remotely driving the car as it navigated the complex city environment presented by the Urban Challenge. 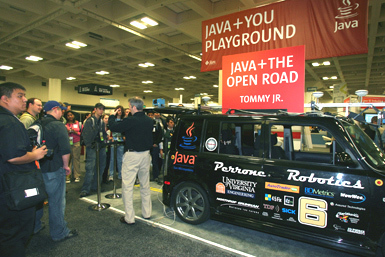 'Under the hood' Tommy Jr. (above) is comprised of a general-purpose robotics platform built on Java. "Java is used from the ground up," said Perrone, "We've got Java controlling the actuators that actually turn the steering wheel, hit the throttle, hit the brake... So we use Java at a low level to actually do the vehicle controls, and we use it at a high level: We use Java Real-Time to do the sensor fusion, and artificial intelligence, and decision making responsible for figuring out how the vehicle should plan its route and navigate the route along the way." In the breakout sessions, presenters from Arizona State University (above, left to right) Eric Engle, Saadat Anwar, and Scott Dickenshied gave a technical session on “Mapping Mars” -- giving both a technical overview and instructions on how others can access and use JMARS (Java Mission-planning and Analysis for Remote Sensing), a Java-based information system developed by the Mars Space Flight Facility at ASU. JMARS leverages geospacial data for scientific analysis and imaging, including data collected by Mars Odyssey, Mars Global Surveyor, Mars Reconnaissance Orbiter, and in the future, the Lunar Reconnaissance Orbiter.